Puerto Banus is a small port but very high end. The harbor was too small for the ship to dock so we anchored out and were shuttled in on a launch. However, the harbor was full of expensive yachts. The first car we walked by as we got off the launch was a Maserati followed by two Ferraris and two Bentleys, not a place for spending spare change. It was a pleasant way to get some exercise in the sun. The weather has been perfect all during our cruise with temperatures in the 70’s and bright sun. I brought a light coat along expecting a chill on the water but I’ve rarely used it. The boat is an example of how to build a luxury yacht. It’s 439 ft long with a beam of 54 ft and draws 18.5 ft. 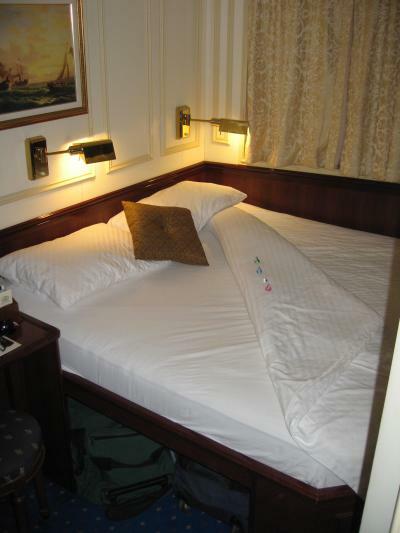 The maximum number of passengers it can carry is 227 but only about 160 are on our cruise. 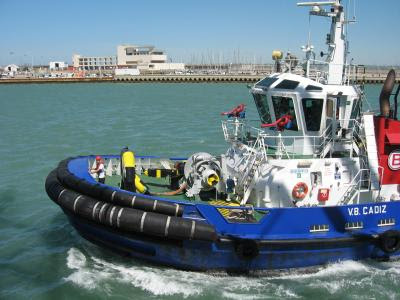 With a crew of 106, there’s a good ratio of passengers to crew and it shows in the service. The interior is all done in varnished wood with carpeted floors. The dining room can seat everyone in one sitting. The interior is polished wood and the tables are set with tablecloths and crystal. 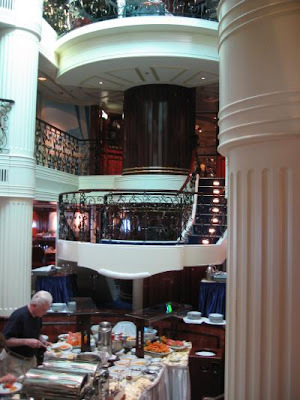 The entrance to the dining area is down a spiral staircase with a full view of the day’s cuisine. You have your own waiter that’s dedicated to no more than four tables, the service is excellent. Your selection is always served artistically as in the photo (sliced tuna). For breakfast and lunch they serve a buffet with more food than you can possibly consume. There is a breakfast chef that will make a custom omelet for you and a lunch chef that will slice a special serving of the day in addition to all the other offerings. Since they have all nationalities on board, they have to plan for all cuisines. For example, the Germans like sliced cold cuts for breakfast and even slices of cold fish so that’s supplied with a large selection. There are always eight hot selections over a heating flame and under cover for both breakfast and lunch. Dinner is a sit down affair with a full meal served by your waiter. 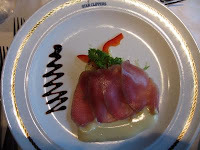 The menu consists of eight courses with wine being extra (about 15 euros). Almost nobody has the full eight courses, it’s too much but if you feel brave, you can order them all. We top the meal off with coffee. You can sit anywhere and it’s fun to select a table and see who comes by. There are tables for two, four, six and eight, your choice. There is also a captain’s table but we haven’t been there yet. 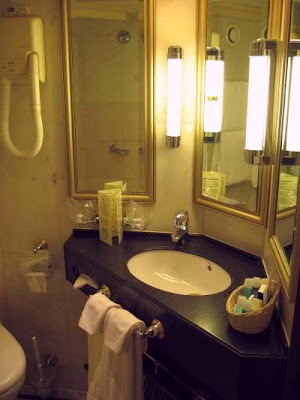 The cabins are finished like fine furniture and the bath is lined with marble on the floor and walls. 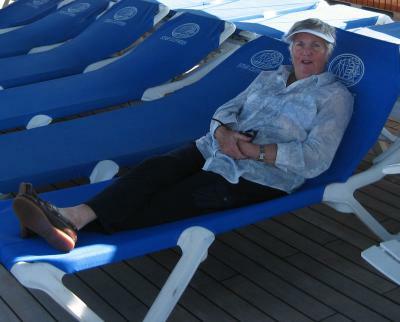 At every stop there are tours you can take to the interior and we’ve taken a few but not every time we dock, we like to just relax some days and enjoy the warm sun and life on the ship. 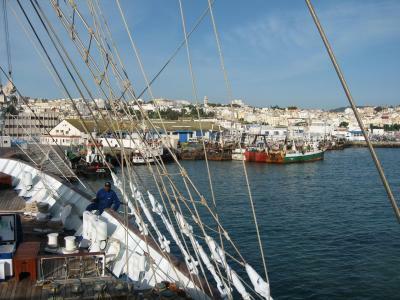 Gibraltar was just across the straits from Tangier so we just sailed a back and forth course for the night. We don’t stay in a port overnight, it’s always just for the afternoon. 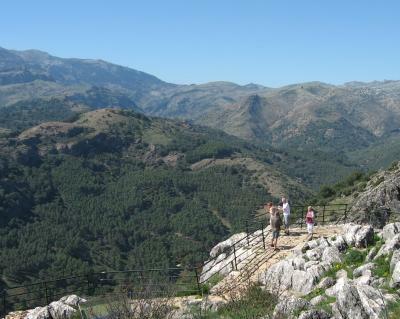 We walked into town with the intention of catching a local bus to the tramway ride to the top of the “Rock” but then a taxi stopped and gave us a good price for a guided tour (12 euros)_to the top and also the caves and fortifications built by the British. 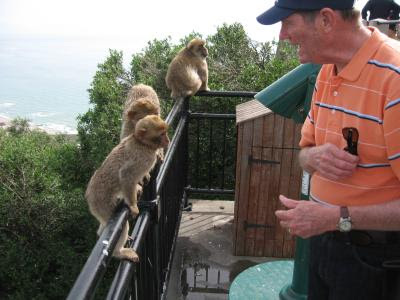 Upward we went in a narrow, one lane road and had our first look at the famous monkeys of Gibraltar. They are very tame and pose for pictures. I didn’t realized that there are real caves in Gibraltar, complete with stalagmites and stalactites. Once at the top, you realize how busy the port is. There were ships anchored everywhere. In the photo you can see our relatively small ship next to a much larger one on the pier to the right. We also toured the fortifications with large cannons installed in narrow passageways drilled out of the solid rock of the mountain. The noise from shooting the cannon must have been painful, I can’t imagine the magnitude of the sound in the tight quarters! I remember firing the small, starter cannon at PYC and even that was deafening. Pulling out of the harbor, it was time for our chance to go up the mast. Leathem and I took advantage of the opportunity. We put on a harness and a safety line but had to climb up the ropes ourselves. However, we only were allowed to climb to the level of the first booms. Still, it was higher than the top of the mast on Fleetwing. 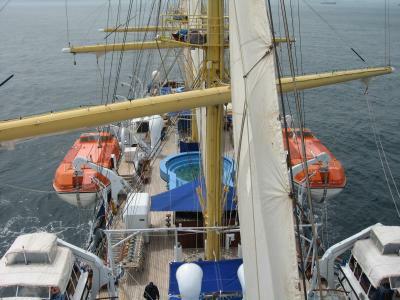 From the top (in the photo) you can see one of the three swimming pools on the boat. I haven’t seen anyone use them yet. Look at the video if you want to see the view from the first level of someone climbing up the webbing to the mast. For the rest of the days and night ,we lost wind and mostly just drifted since we didn’t have far to go for the next anchorage. We set foot in Africa for the first time today! We had booked a tour to a town founded in the 1200’s led by an enthusiastic, local tour guide. We had been in Japan and all over Europe but we found ourselves in a town that appeared most unlike the US. 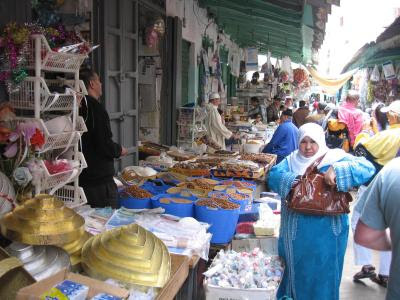 The women all wore Arab garb and most of the men wore the one piece covering typical in Arab countries. 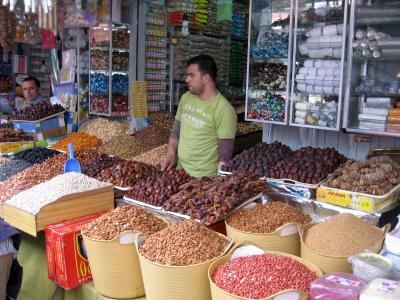 We were led on a walking tour of the old part of town where vendors of all sorts had small stalls selling their goods. There were a fantastic variety of items for sale, all neatly arranged for display in very narrow aisles, barely wide enough for us to pass. It was a good thing we had a guide since we had absolutely no idea of the way out. All was most interesting until we were led into a room where it had been decided (without our consent) that we should be shown a sample of every Persian rug ever made. Rug after run was rolled before us which was entertaining for awhile but then they started showing each rug one at a time, asking if anyone was interested in buying it. The rugs were beautiful but we didn’t need a rug. After the long rug session, we were led into another room for refreshments and a walk back to the bus. The countryside was green and hilly with a lot of construction in progress which the guide was inordinately proud of. He repeated many times of how tolerant the citizens were and that Morocco was the third country that recognized the newly minted USA back in the 1700’s (of course, he knew most of those on the bus were Americans!) 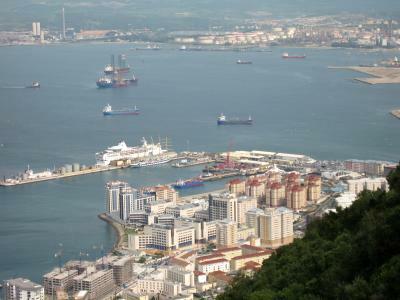 Most of the tourists come from Spain, just across the straits. We motored throughout the night. I was somewhat concerned about being in close quarters with wind and waves pitching the ship to and fro. I’ve always been fine up on deck but down below with the horizon out of sight, I’ve sometimes had a problem. However, this vessel is very smooth and I never felt a twinge. I slept like a log. In the night the ship went by the Rock of Gibraltar and out into the Atlantic and north to Cadiz which we reached by 1:00 pm. Unfortunately, we never raised sails! The wind was wrong but we’re to leave Cadiz tonight at 7:00 and with the winds out of the north, we should see our first sail. The first order of the day was a life jacket drill in which we learned how to properly tie a life jacket on, not obvious at first. 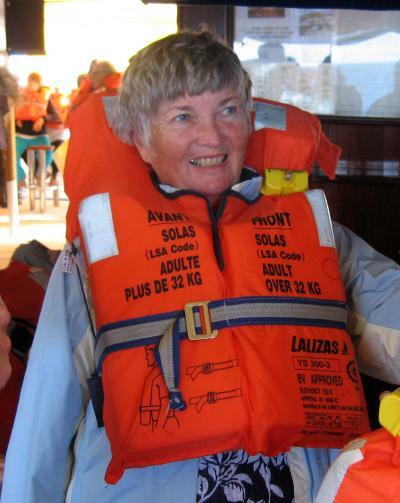 They said they never had to use the lifeboats but you never know – so drill! Coming into Cadiz, we saw that the navigation system was reversed with reds on the port side and greens on the starboard side. The Europeans call us backwards but, of course, that’s a point of view. Even with their buoy system being reversed, we still made it into port safely. No sailing into dock with the sails flying, we had two tugs to help out. We also required a Pilot to come aboard to accompany us into harbor, a practice that employs a lot of pilots I guess. It was not a difficult harbor, wide open. The weather continues to be very warm, no long sleeve shirts yet. In fact, there’s a dress code on the ship. For dinner, you must wear a shirt with a collar and sleeves (no T-shirts!) and no shorts including Bermuda shorts. I’ve just been wearing knit shirts and long pants.There are a total of six meals served each day although I’ve only been able to make three so far, so much food, so little time. In every port a pilot was required to board the ship for guidance into the harbor. See the video for the neat maneuver. Finally, the ship's internet connection was fixed today, 4/30! 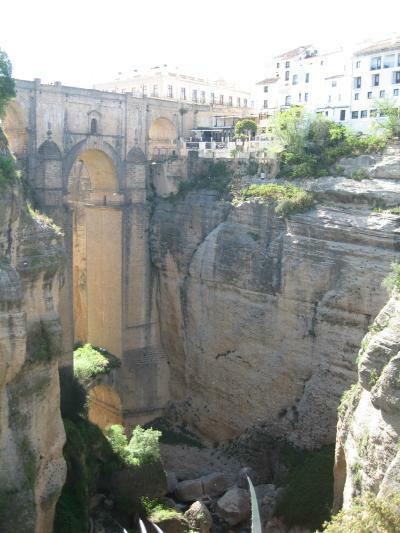 We wanted to see the old city of Ronda which involved yet another impossibly steep road trip to the top of the gorge. There were places the road was every bit of a 45 degree incline and it was a wonder that the car didn’t slip but up it went. It’s a two way street too! However, we didn’t meet any on-coming traffic, luckily. The Sierra Nevada mountains were between us and the coast and there were two routes. There was the super highway route of the winding, twisty route through the mountains so naturally we took the twisty route even through the GPS advised against it. Leaving Ronda we started to climb and the road gradually dwindled to just wide enough for two cars if you pulled over to one side. “Our side” happened to be the outside and the starboard passengers got an excellent look at the 1000 foot dropoff where the pavement ended. Nevertheless, the scenery was spectacular and I would recommend the route. Finally, we boarded and the first thing they did was check us for a fever with a hand-held IR thermometer. If we had shown a fever, we would have not been allowed to board. The rest of the day was spent in relief, ahhh to calm down and relax! 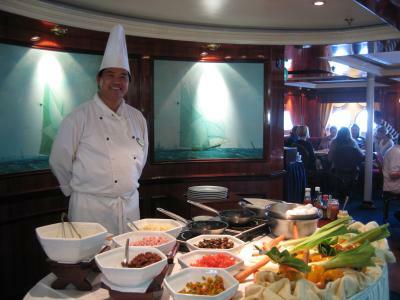 We had dinner and were all on deck for the cast off of the lines for our cruise overnight to Cadiz. It was a real interesting drive today. We drove south through flat plains as flat as anything in the Midwest and then suddenly hills appears with canyons and it was up and down time in the car. The terrain was extremely varied and we tool lots of photos, only a couple are included here. 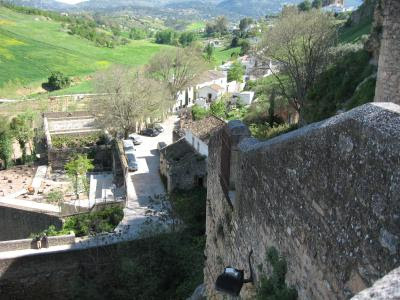 Ronda is built on the side of a cliff with a deep gully cut by a stream through the middle. We intended to walk to dinner that night but Leathem and I decided to scout out the path first. The GPS said it was only 0.8 miles to the restaurant but what we didn't realize was that it included a 1000 foot altitude increase! After a few minutes into our scouting routing, we realized that the girls would never make that hike and decide on taking the car. By the time we got back, we were virtually exhausted but of course we never showed it and volunteered to take the car to the top the second time (see photo for a look at about 1/2 the height up)! Even that ride was not without excitement. The road was so steep that you could not see the road ahead when coming to an intersection (the hood hid the view). On faith you pressed on and sure enough, there was a road beneath the car when you tilted forward onto a flat intersection point. We found a restaurant at the top of the cliff with a magnificent view of the gully where we ate dinner which was excellent as we watched the sun fade. Walking back to the car parked underground, we started back down which equaled the excitement of the trip up! It's a wonder the car just didn't skid downward but somehow that tired gripped enough. We feel that now we are getting into the swing of things in Spain since we finished with a bottle of wine at 11:00 pm. 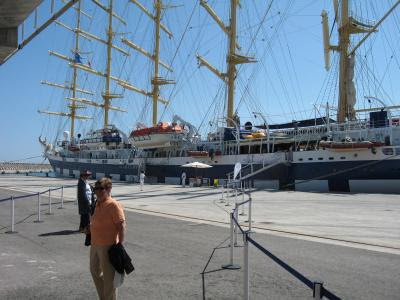 Tomorrow it's onward to the Royal Clipper! The highlight of the day was a trip to the Prado, a world famous museum in Madrid. 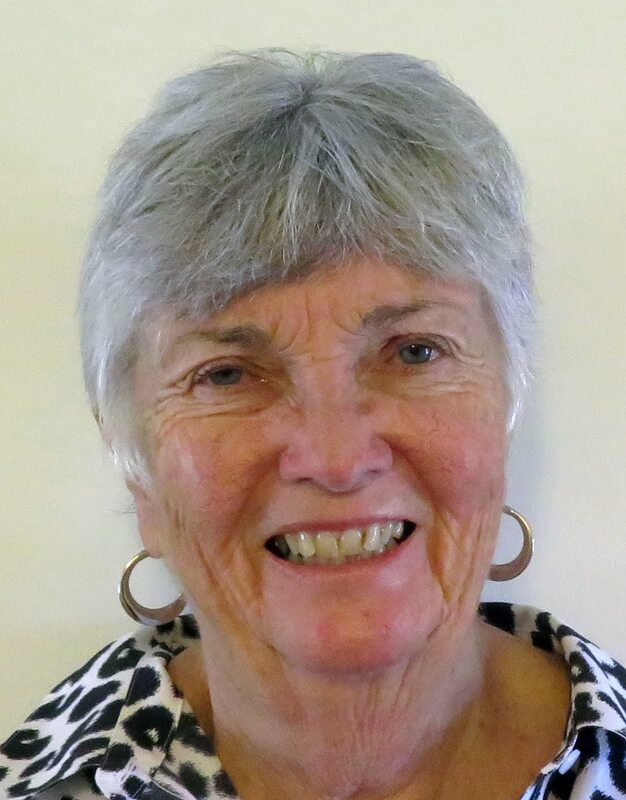 Ann was in heaven with paintings she had heard about but never seen in person. Unfortunately, we were not permitted to take photos of anything inside the museum so memories will have to do. 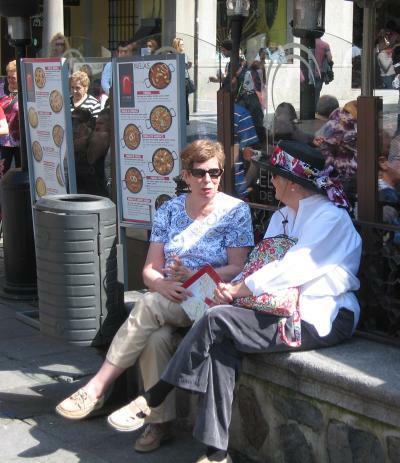 We headed south to Toledo which used to be the capital of Spain. It’s built on a hill and is fascinating to explore in the old part of the city. The streets are barely wide enough for one car to get by so it’s largely a pedestrian area. The weather was wonderful with full sun and temperatures in the 70’s. We haven’t yet adapted to the eating times of the local population. Breakfast is practically nonexistent, just a cup of coffee. Lunch comes between 1:30 and 4:30 with dinner served from 9:00 to 10:00, mostly at 10:00 or later. Even with these late times, you still see lots of people out early in the morning on their way to work, don’t quite know how they do that. We’ve gotten in a snacking routine more than formal dinners and lunches. Go with the flow as they say. 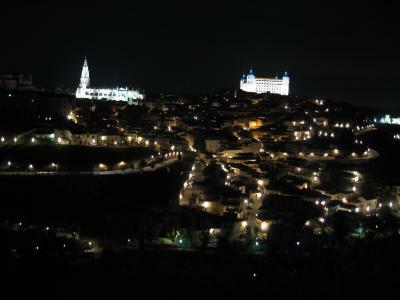 At night the city is ablaze with lights and it’s especially dramatic with the city being built on a hill. So we played tourist and just drove around town at night snapping pictures. We didn’t get back to our hotel until 10:30 (when most people were in the middle of their dinner!) It’s further south on Sunday for our last day before boarding the boat. Newark was very busy as we expected but we still made it through all the check-in lines in less than 30 minutes which gave us plenty of time to rest up in Continental's President's Club lounge. However, we had to recheck in at the gate counter since they wanted to be sure of filling every seat. There were people still waiting for a flight out, all were full. Due to all the checking, we were an hour late taking off. The flight itself was uneventful and we even were served two meals, a dinner and a small breakfast! The Madrid airport was no problem and the Hertz car rental was right by the terminal (Terminal 1). I had loaded my Garmin iQue with maps of Spain before I left and just plugged in the address of the hotel in downtown Madrid, the iQue guided us there without a wrong turn. It would have been a hopeless task without the GPS - many, many turns. The dinner hour in Spain starts at 8:00 pm but the most popular time is 9:00 to 10:00, much too late for us with the 6 hour time difference (Spain is earlier). It's now 10:00 pm over here in Spain but it's only 4:00 pm in NY. 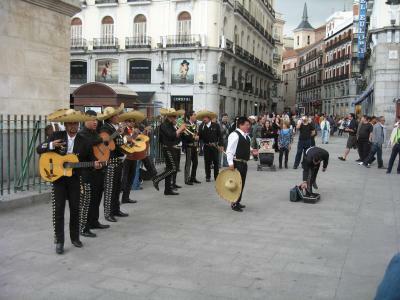 Madrid is very festive with street performers all over the place (see photo). We ate at Botin which is the older restaurant in the world according to the Guinness Book of Records. 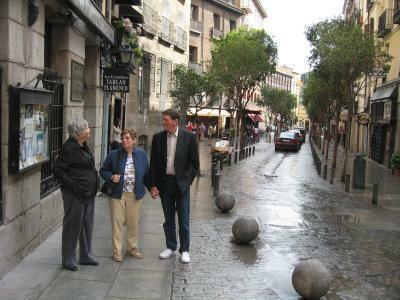 It's in the background of the second photo, a typical side street scene in Madrid. The strange thing is that the street are packed with people! There's hardly room to walk, the city comes alive after 7:00. On Friday we're off to the south to work our way to Malaga for picking up the Royal Clipper, our home for 12 days starting Monday.